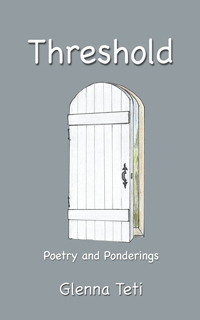 A Brooklyn native, Glena Teti has written poetry for over 25 years. In Thresholds: Poetry and Ponderings (2014) she examines the roles and values of people living in relative prosperity and peace in a world of on-going turmoil, poverty, conflict and greed. A door opens and closes. A threshold is crossed. We move from one reality to another. How many thresholds do we cross in a lifetime -- physical, experiential, spiritual? These poems pose questions we should all ponder.